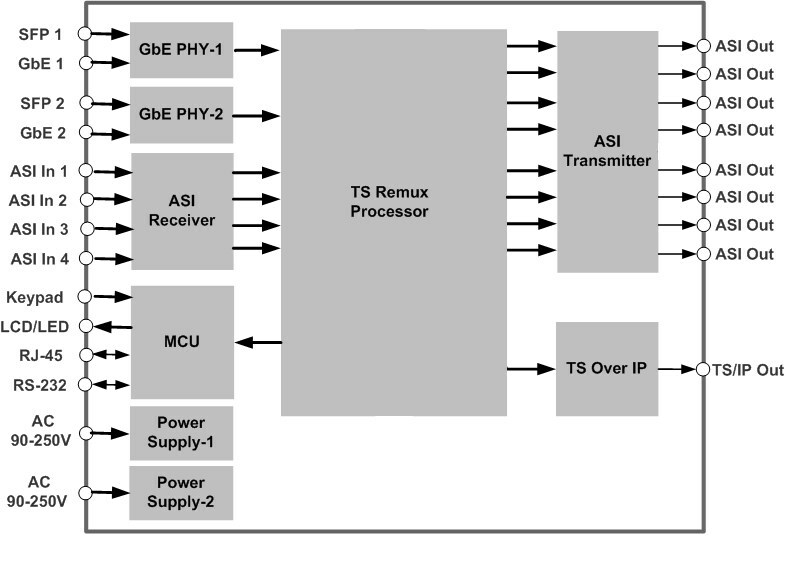 ADV-3480MX is an advanced DVB transport stream multiplexer/re-multiplexer. It can receive up to 160 MPTS/SPTS through the GbE port and/or 4x ASI streams through the four ASI input ports. ADV-3480MX can output 8x ASI multiplexed streams through 8 ASI output ports. It can output up to 16 multiplexed IP streams via GbE output ports. ADV-3480MX supports PSI/SI regeneration or pass through. It can support up to maximum 256 PIDs or 50 TV services per each TS with re-mapping, bypass, and filtering functionality. With its multiple input and output ports, flexible configuration and powerful TS processing functionality, the ADV-3480MX is a must have missing piece of the puzzle that connects the TV sources from professional IRDs and encoders to the DVB modulators. 2 GBe + 2 SFP ports: up to 160 IP input MPTS/SPTS streams; up to 16 multiplexed IP output MPTS streams.